Search engine optimization is a common approach for online businesses today. Not paying for clicks from Google and Bing is exciting, but the execution falls apart when a plan is not adequately set up. In this blog post, I will share how I develop search engine optimization strategies and plans with an example of a gardening website as my focus. 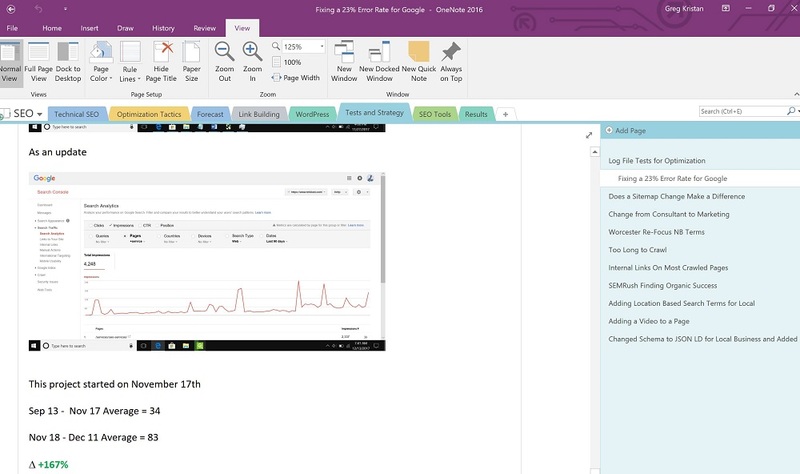 I record each SEO task that I work on for myself and my clients using OneNote. With OneNote, I organize my thoughts, ideas, test, results, and so more so I can reference them at a later time. SEO, in my opinion, is an easy channel to get lost with because results are not immediate. Search engine optimization takes weeks, months, maybe even years to see the full effect, so you have you have to have a diary to reference. Keyword exploration with a focus on low hanging fruit is a fantastic way to drive quality traffic to your website. Let’s say I want to write a blog post about gardening tips for my site. My website is only a few months old, so it won’t rank for terms like “garden tips”, but I can still use that root term to discover long tail opportunities which is the low hanging fruit. Developing a list in Excel that expands upon that root term will open my eyes on the ideal landing page. Using the excel spreadsheet as the compass, I can visually see if I should create more than one page. I can also see if some of these topics have been covered in the past by my domain. A simple way to check is to perform a simple Google command that looks like this below. When you perform this command from above, you want to see if Google comes back with previous pages that live on your website around that topic. If no results come back, you can create a new page that covers this topic. If you notice that you have one or more pages that include this topic, you should consider repurposing the content or redirect it to this new page. The case for both depends on a lot of factors, but I would repurpose if the material is evergreen to save time. I would redirect if I had more than one page on my domain that covers this topic. Let’s say for example I want to develop an ultimate guide on winter garden tips. When I perform that command in Google, I see that I have a few blogs that cover this topic. When I check out each blog, I notice that the quality of the posts is not excellent, so I would flag that as a 301 redirect option. A 301 redirect will pass SEO authority to the new page, so I can already receive a boost when I post my article to the web. I use SEMRush as my primary tool to track SEO, so I recommend that as the go to tool for professionals. You can follow your keywords on a daily basis so you can see if you gain traction from your hard work. After you put the guide out on the web, you probably will not rank unless you are a prominent and established website. That is OK and expected, but it’s the next steps that separate you from the thousands of other blog posts that cover this topic. There are countless ways to perform a link building strategy, but I will give you two options to consider. The first option is to use manual Google search operators to find articles that could benefit from linking to your guide. 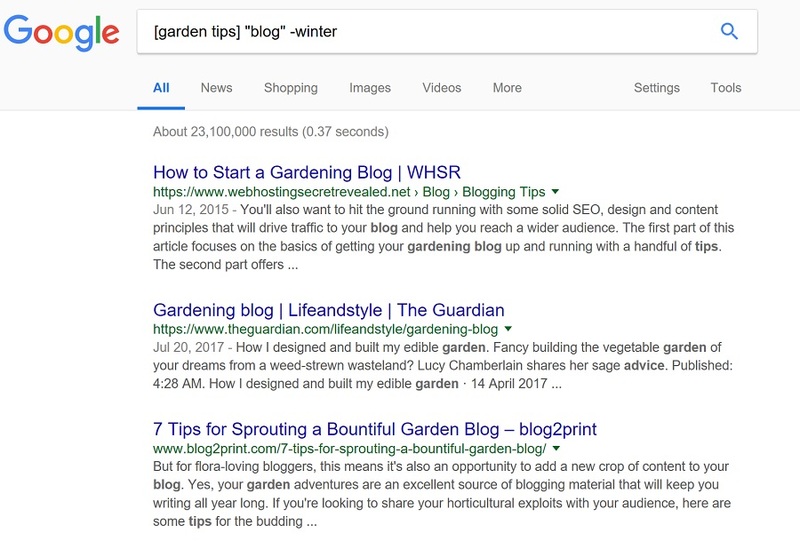 Let’s say we wrote a blog post around “winter garden tips” because it has a good amount of search volume and low competition. You can use an operator in Google to scout out places that talk about garden tips, but do not include the term winter in their post. This strategy works because you can reach out to these authors and educate them on the importance of gardening in the winter. Since the blog author did not talk about this in their article, you might discover that they naturally link to your piece for their audience. The second way to perform link research is to take the top ranking websites in Google and export them into a list. You can use a tool like SEMRush, Majestic SEO, Ahrefs, or something else to look up where they get are getting links. From there, you can then strategize a way to reach out to these bloggers and see if you can receive a link. Once the content is live, you can expand upon your target terms using a few tricks. 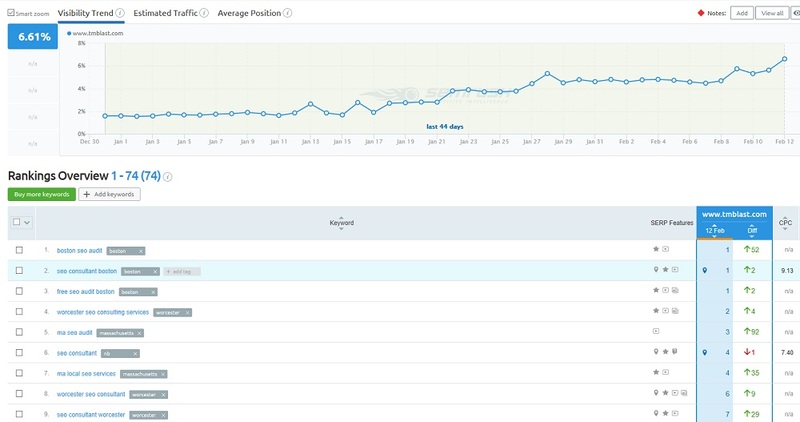 The first trick is to use the search terms report from Google Analytics if you have an internal search box on your site. I like this strategy because you want to satisfy your audience, so if people search for long tail queries, you want to include that in your post to rank for that as well. The second way to expand keyword reach is with Ahrefs. With Ahrefs, you can export the search terms that your competitors rank for and see if you rank too. 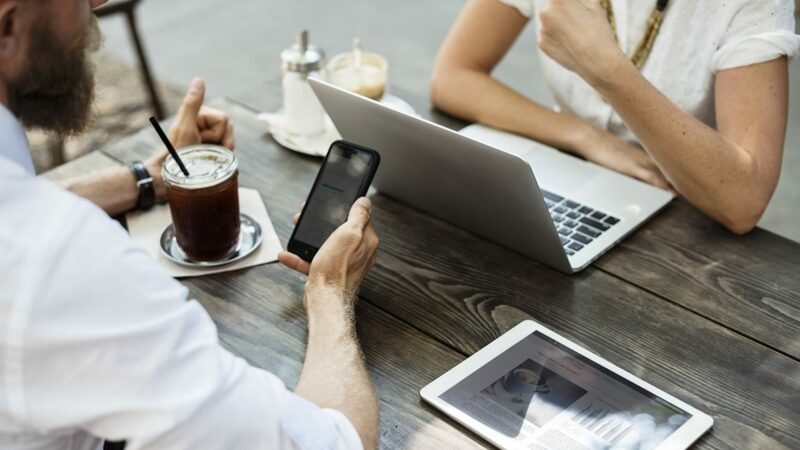 The chances are high that your competition ranks for terms that you don’t, so that can be an excellent addition to your guide with a proper plan. The Third option that you can use is a typical SWOT analysis report. It’s easy to say that every blog post has 1 thousand words, so then I will write 1.2k words and I should outrank the competition. Instead, I look for ways to engage my audience that may be similar or different than a competitor. Maybe one competitor has a video on their page, but they use YouTube as their host. You can include a video on your site too, but use a platform like Wistia that offers more SEO value than YouTube. Perhaps your competition has a video but does not have closed captions for it. You can take that as an opportunity, add closed captions, and take it one step further an add a written transcript of the video on the page. If you want to learn more about video SEO, you can check out this article called Wistia vs. YouTube: What’s the Difference? Remember how I said you should document everything at the start of this blog post? Imagine if did not record everything you did, but results came in positive for your website. Your boss might ask to replicate your strategy again for another blog post, but you don’t remember what you did. Without documentation, you will forget about the ways you tackled this opportunity and thus leave out something for the next strategy. It’s worth noting that one approach does not fit all projects, but you can still reference the good and the bad ideas for your next project at any time. If you are looking for help, I offer Boston SEO along with a SEO audit to help with your strategy.